On last Sunday’s episode of American Dad, entitled “A Ward Show,” Stan and Francine sign over custody of their teenage son to Roger, the Roswell alien that lives with them. 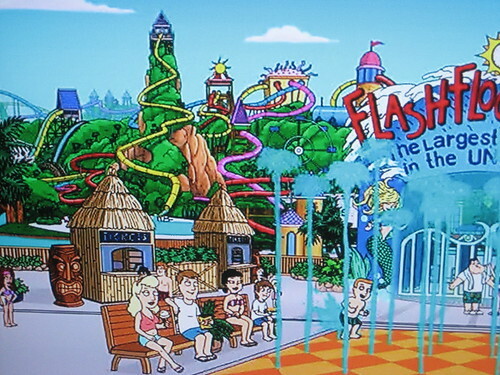 In celebration of their empty nest, they head to Flash Flood Acres, the largest water park in the universe! The ticket huts were covered in thatch and bamboo and flanked by big tikis. 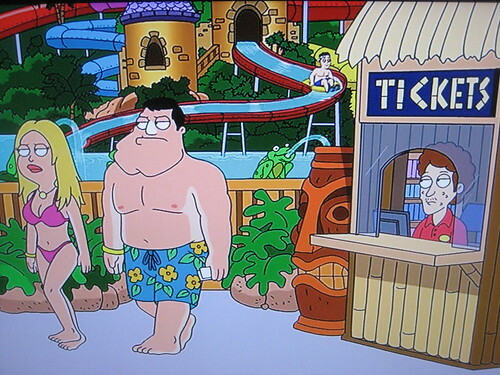 But there is at least one tiki-themed water park beyond the realm of cartoons. According to James Teitelbaum’s Tiki Road Trip, our own Hurricane Harbor in Valencia has three Moai in an area called Tiki Falls. It’s been at least a decade since I ventured out to Magic Mountain so I don’t really recall. Perhaps a visit should be in store next summer? It’s always fun when they put Tikis on TV. I’m always playing Where’s Waldo to see if I can spot them. I’ll have to give this episode a watch. Mahalo!